With so many people using magnets in more and more places, we thought we would take a moment to step back and discuss some of the basics. How do magnets attract to one another? How do they repel? How can I magnetize a steel screwdriver? Magnets can either attract or repel each other. A permanent magnet is an object that produces a magnetic field around itself. It is this field that enables them to stick to each other and to some types of metal. Specifically, they stick to ferromagnetic materials like iron and things that contain iron, such as steel. This includes everything from your car's steel body to your refrigerator door. They're also attracted to nickel and cobalt, and a few other rare-earth elements. Magnets won't stick to most other types of metal, including aluminum or copper. When will magnets attract or repel each other? The rule to remember is that opposites attract. Every magnet has both a North and a South pole. When you place the North pole of one magnet near the South pole of another magnet, they are attracted to one another. When you place like poles of two magnets near each other (North to North or South to South), they will repel each other. That's how they work, but why? The best Physics questions are often the most basic. Why do magnets act the way they do? The question is both simple and complicated, with some parts of it yet to be truly understood. It's similar to asking: Why does gravity work the way it does? Physics studies and models this phenomenon. Electromagnetism is one of the four basic forces in the universe: electromagnetism, gravity, and strong and weak nuclear forces. It describes the force that's the result of the interaction between two charged particles. If that sounds too much like something a Physicist would say, it should! After all, thinking about some of the theoretical implications of electromagnetism led Albert Einstein to develop special relativity in 1905. You might start with the Wikipedia article on Electromagnetism, or go as deep as the many textbooks written on Physics and Chemistry to learn more. There's more material than can be covered in one blog article! What does Pull Force Case 1 mean? On our product pages, we list the Pull Force of a magnet as we've measured it using specific test conditions. 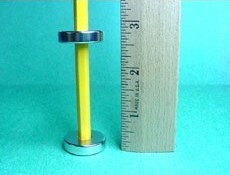 A good, comparative measure of a magnet's strength is Pull Force Case 1. This is the force you need to pull a single magnet directly away from a large, flat steel plate. A similar description can be found in our FAQ. If you're wondering why Pull Force Case 3 (magnet-to-magnet) isn't listed, here's why: When two magnets are touching one another, Pull Force Case 3 is equal to Pull Force Case 1. It's the same number! Wait a second, you say, a pair of magnets seem stronger. How can we say this? Well, first and foremost, because we've measured it many times. It might seem like a pair of magnets is stronger for two reasons: one, if you're sticking a magnet to a very thin or small piece of steel, you will see a pull force weaker than our listed Pull Force Case 1. Two, a pair of magnets that are some distance apart will pull with more strength than a single magnet at the same distance to a steel plate. At a distance, Pull Force Case 3 is usually greater. When touching, however, it is equal to Pull Force Case 1. What magnets can be used to repel each other and hold up 10 pounds? Using magnets to repel each other is one way to try to achieve a frictionless bearing. In practice, it can be difficult to remove all friction. While a pair of magnets will repel each other, they are not stable in this condition. One magnet won't simply float forever above another magnet. The picture on the product page for our RX054 magnet illustrates this point. It shows one ring magnet floating over another, with one key detail: The pencil sticking through their holes provides the needed stability. You might mimic this setup in your own levitation projects. But what about if I add another magnet in another position, to make a magnetically stable "pocket" for the floating one to sit in? Sorry, it doesn't work that way. As you add more and more magnets, the magnetic fields interact in complex ways that are hard to summarize with simple rules of thumb. What's more, Earnshaw's theorem states that no matter what way you orient the magnets, you can't make it stable with stationary magnets alone. See the section in that article about loopholes if you're trying to get around this! When considering the repelling force between two magnets, you must consider the distance between them. 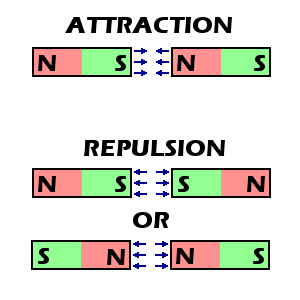 The farther two magnets are apart from each other, the weaker the repulsion force will be. Our Repelling Force Magnet Calculator offers a way to quantify these forces online. For example, a pair of RX054 magnets will repel each other with about 25 lb when touching, but only 5.4 lb when held at a distance of 1/4" apart. How to magnetize a screwdriver, or other steel objects. Take one end of a neodymium magnet and stick it to the base of the screwdriver's shaft. Slide the magnet along the length of the steel shaft, all the way to the end. Then remove the magnet from the shaft, and repeat a few more times. The steel is now fully magnetized! Do not rub the magnet back and forth -- moving it in opposite directions will work to cancel each other out. You can use this same method to re-magnetize old ceramic, ferrite or Alnico magnets. This is a great way to re-magnetize the needle of a compass. Choose a magnet sized like what you're trying to magnetize, though it isn't too critical. While the animation shows a D4X0-ND magnet, a nice D6C magnet works quite well too.